I've never been a super active person. I never loved sports or running or anything that meant I couldn't read or play video games. I do have an elliptical machine that's been in storage since I moved in with Chris. Yes, I did use it. It was not a clothes hanger. But I wouldn't say I loved it. I have a Wii fit, and we bought a Kinect. I actually do like the Kinect sports game, but we have a slightly too small living room and we are on the third floor of an apartment. It just seems rude to bounce around at all hours of the day and night. Last year I researched running. Mostly on the About page. I talked myself out of it last year but with this recent bout of good weather I thought I'd try it. 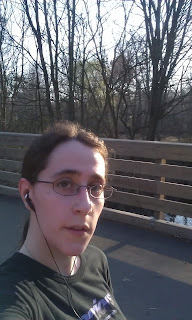 Today was day one of running/walking. Blargh. We will see if I stick with this or decide I'd just prefer to bounce around kicking imaginary soccer balls with the Kinect sports game.